1. My Basal Metabolic Rate (calories burned at rest all day) is pretty much the same as the estimate my BodyMetrix Report, but my actual calorie burn based on my HR and activity level is 700-1000 calories higher than that. This means that calculating an accurate activity factor is way more important than the baseline number determined by your age, height, & weight. 2. Even though the FitBit only picks up ~20 minutes of “Activity” during a coach Tyler CrossFit class, I burn 350-500 calories more on a training day than on a rest day. WOOOOOOO!!! 3. I burn more than 50% of my daily calories before noon. This is part of the reason why we recommend eating a large or multiple breakfasts on the RadixLife 12 Week Challenge. If you only have a small breakfast, you’re putting yourself into a severe caloric deficit early in the day. This will make you feel “snacky” later on, because you’re unsatisfied and low on fuel, especially if yo’ve only had a light “healthy salad” for lunch, too! Get 2-3 real meals in before 1pm and you’ll stave off the afternoon cravings. 4. I wake up a lot in the night. Partly because Malachi also wakes up lol but I was surprised to learn that it is normal to wake many times in the night, even if you don’t remember it, and that the majority of your time spent asleep is in light sleep, less than 20% in REM and deep sleep. I do get less REM and deep sleep than average, but my light sleep is great and most nights my awake time is also average. *Side note: we just got a new mattress from a Canadian company called Silk & Snow and I LOVE IT!!! 5. I can see how it would be easy to become obsessed with tracking data (part of the reason I don’t wear it 24/7). I would recommend only using it for either daytime or nighttime for a period to track specific metrics, or for 3 days on then take a break. It’s super important to remember that these numbers are just numbers, no the be-all end-all of health and fitness. If you can’t look at them with an objective & outside perspective, maybe you should focus on different elements of your nutrition and performance. – It syncs with MyFitnessPal for a great food log to track calories in vs. calories out, providing a range to be “in the zone” which is better than trying to hit the same exact numbers each day. – You can track and create goals for miles walked, steps taken, glasses of water/day etc. to motivate you to stay on track and keep moving. – The sleep tracker is super interesting and the dashboard is easy to use. – Kinda burns my arm when I’ve worn it too long so I don’t set it to sync automatically so I don’t use the notifications element. 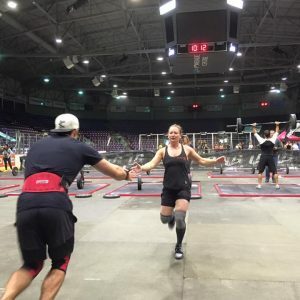 – Coach Tyler’s CrossFit class deserves way more than 20 minutes of activity! But I haven’t bothered to explore the manual activity tracker and enter in “20 minutes weightlifting” etc into my caloric burn because I prefer to just see what it says based on heartrate.